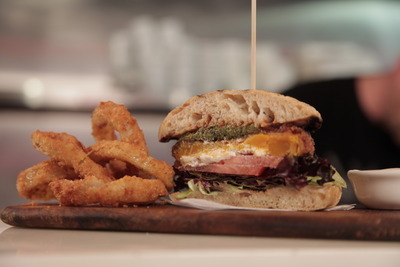 Some occasions call for a burger of a calibre higher than that of a Fillet-o-Fish at McDonalds. In these times of need, you're going to have to drop the Whopper, walk away from the Angus, side step the Zinger and go for something a little more substantial. I'm talking about a little place that's just recently opened in Fremantle - Jus Burgers. When burgers are served on plates and there's more taste than preservatives, you know you've come to a place that knows how to make a real burger. My girlfriend and I found Jus Burgers when we were searching for some gluten free eating spots in Fremantle. We soon found out that Jus Burgers not only served gluten free burgers, but also one of the tastiest gourmet burgers we had ever had. On top of the taste, what makes Jus Burgers really special is that all of their food from the potatoes to the poultry is freshly sourced from local WA suppliers. The meat is 100% wheat, additive and preservative free with only a dash of salt and pepper added, so you can rest assured that what you're eating is actually real meat. 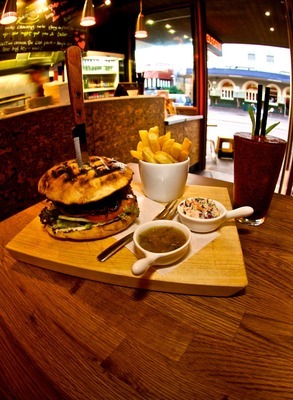 The menu is extremely varied and gives you a tonne of options when it comes to making your burger. You can select from a wide range of meats including organic beef, Wagyu beef, original lamb, original chicken, Pancetta chicken, Mozzarella chicken, fish, bokka, and even kangaroo. The burgers come served in Turkish Bakery bread rolls, however those who are gluten free can choose to go for a white or whole meal gluten free bun. Vegans and vegetarians aren't forgotten either, Jus Burgers also has a bunch of vegetarian options on the menu including a marinated tempeh burger and chickpea burger. All burgers come served with lettuce, tomato, Spanish onion, home made aioli and relish, but if that's not enough for you there's also a bunch of toppings and sauces to choose from including cheese, bacon, avocado, tahini yogurt, relish and french mustard. Burgers range from $11 - $15 depending on meat, and additional toppings and sauces are just a dollar extra. You can also choose from a large range of sides to go with your burger including freshly cut skin-on chips, regular, Spanish, or Middle eastern slaw, onion rings, or a house salad. Jus burgers also has a tonne of drinks available including orange juice, mango milk, pomegranate frappes and pineapple crushes. Sides range from about $4 -$6, with drinks ranging from $3 - $7. There's not enough space in this article to feature the entire menu here so click here to view it for yourself. On top of an awesome menu and great tasting burgers, Jus Burgers has a really unique and cool vibe to it. The burger bar has found a way to be laid back yet classy at the same time using recycled products and visually appealing graffiti art featured all over the store. It's a place where you would be happy to take a date, friend or family member to have a good time. Jus Burgers Fremantle is located on the 'old fish corner' on the corner of South terrace & Henderson st mall, directly opposite the sail and Anchor pub. Writing this article has made me super hungry so I'm going to have to leave it there, but next time you're in Fremantle definitely give Jus Burgers a shot if you're looking for a burger that is truly "just a little bit fancy." Jus Burgers are also located in Leederville, Subiaco and Northbridge, but I haven't check those ones out yet. 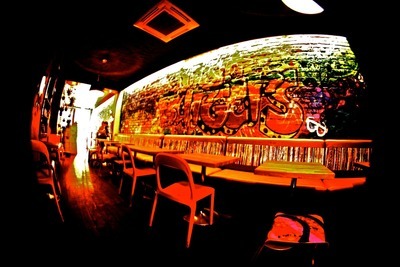 For more information on Jus Burgers you can head to their website at www.jusburgers.com.au. Hey Emilie, thanks for reading! I'm glad you enjoyed it. Yes, you should definitely check it out, it's a great little place. I subscribed to your articles, they look great! Feel free to subscribe to mine if you haven't already.